Now that metro Atlanta is home to Mercedes-Benz Stadium, the North American headquarters of Mercedes-Benz and six Mercedes-Benz dealerships, the company figured Atlanta needed one more Mercedes-Benz experience. Coming this fall to Lenox Square will be a Mercedes-Benz showroom. Located in the former Bebe space on the mall's main level, Mercedes-Benz will open what mall representatives are calling a temporary "pop-up" store. The Bebe space is nearly 5,000 square feet and has sat vacant since the women's retailer closed all their stores nationwide this past spring. The space is located near the Peachtree Road facing entrance of the popular Buckhead mall, adjacent to Panera Bread and across from UGG Australia. While cars displayed in/around malls are not uncommon, dealerships and/or showrooms are. Modern car manufacturer Tesla opened a showroom in Lenox Square's Luxury Wing in late 2014, and operates a number of showrooms in malls and upscale shopping centers nationally. Tesla may very well have started a trend with Mercedes possibly not the last car company to rethink their showroom strategy and open in malls. 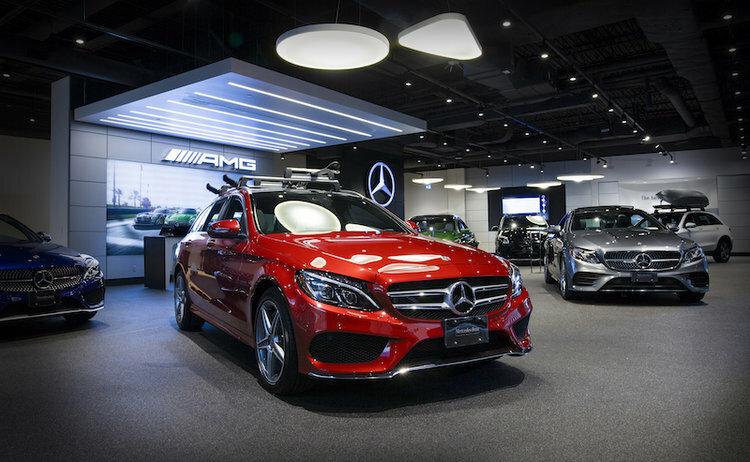 Earlier this month, Mercedes-Benz Canada debuted a new showroom at CF Markville, a mall in Markham, Ontario, about 22 miles northeast of Toronto. The showroom, "Mercedes me," which the company said is "a new concept for the automaker," is actually the second for Mercedes in Canada. The first opened in the Aberdeen Mall in Richmond, B.C. 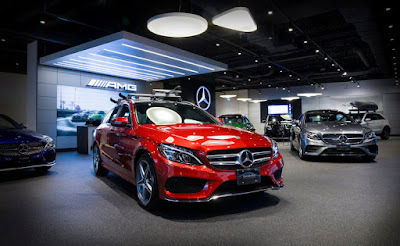 The showroom features five or six of the latest Mercedes models and also sells select items from the Mercedez-Benz Collection of retail products. The new Mercedes-Benz showroom at Lenox Square is expected to open in mid-October and remain open through the holiday shopping season. The full-service Mercedes-Benz of Buckhead dealership is located about three miles from Lenox Square on Piedmont Road. Mercedes-Benz Stadium has been a good luck charm for its two home teams (Atlanta Falcons and Atlanta United FC) with the teams a combined 6-0 since they started playing their respective regular seasons at the stadium earlier this month. With luck, the Mercedes-Benz showroom will prove equally as lucky for Lenox Square as it continues to innovate and differentiate its tenant mix in an ever changing retail environment. Are you excited for the addition of a Mercedes-Benz showroom to Lenox Square? Have you been to a Mercedes me showroom before? What is your favorite luxury automaker? Mercedes Benz television ads have diluted the brand to the level of Dodge or Nissan in my eyes. The competition must really be gnawing at their heels. Tesla is in the Luxury Wing and Mercedes is not ? The "luxury" label has been mainstreamed and misused. Another reason (for me) not to go to Lenox or any mall for that matter. Shouldn't they have done this at the same time as opening their stadium? Bet those cars get jacked.